Located between Philadelphia and Trenton, Willingboro has a three-hundred-year history of forward thinking. Founded in 1688 by Thomas Olive, a Quaker who left England seeking religious freedom, Willingboro evolved from an agricultural community longing to rid itself of British rule to a suburb unique in the United States. Using many vintage photographs and historical documents, Willingboro chronicles the rich lives and experiences of its residents, including William Franklin, the last royal governor of New Jersey, and track star Carl Lewis. This volume explores Willingboro's beginnings as a quiet farming community, which was a planned Delaware River crossing site for Washington's army during the Revolutionary War. Close to two centuries later, a Long Island developer replaced the farms with eleven thousand affordable homes that became America's third Levittown. 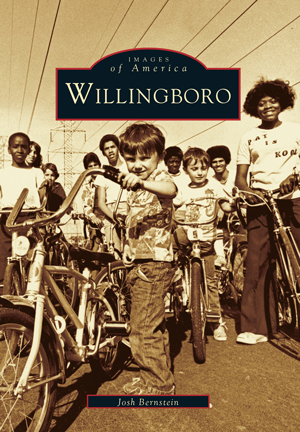 Willingboro is the finest example of post-World War II suburban planning, affirmed in 1960 by the Westinghouse Corporation's decision to use the town as the backdrop for its "picture of everyday American life" advertising campaign. Willingboro gained international attention for its groundbreaking design, campaign visits from John F. Kennedy and Richard Nixon, lakefront resort created through the construction of the Philadelphia subway system, and renowned jazz festival. Josh Bernstein, an award-winning journalist in New Jersey and Virginia, has been covering Willingboro for the Burlington County Times for more than five years. He has amassed a deep knowledge of the diverse community and is pleased to present this look at nineteenth- and twentieth-century Willingboro.